The Resident Tourist: Getting to the Hamptons . . . I'm slightly shocked this weekend will be my first of the season out East. How the summer has flown! I'm sure you know the feeling. But after millions of emails about where to go (Montauk), where to stay (The Crow's Nest Inn), how to get there (LIRR), what to pack (light) and where to eat (still deciding), a few of my besties and I were finally able to plan a weekend getaway out to East End. Thought it might be helpful to share a series of tid-bits from our planning process. Ride the Long Island Rail Road (LIRR) to avoid traffic delays and save some extra cash. Beware: Seats fill up quick on Fridays, so get there early to fight for your spot. 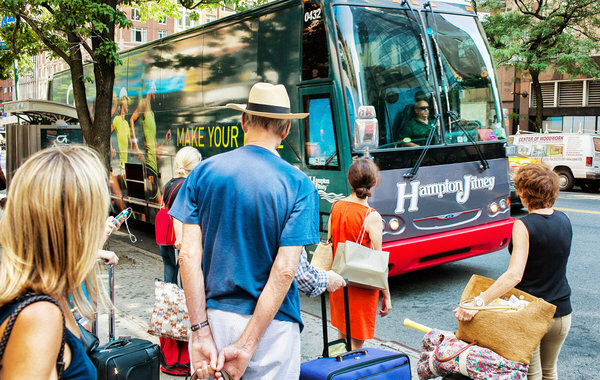 Take the Hampton Jitney, Hampton Luxury Liner, or Hampton Ambassador for a reserved and more comfortable seat as well as comp treats, aka muffins on the Jitney, snack bar/fridge on the Luxury Liner, and wine on the Ambassador. Beware: No bus lane so traffic is unavoidable. Drive along Route 27 if you want to put down the top, blast the music, and enjoy a little road trip with friends. Beware: Traffic will be bad, but if you leave at off hours you may trim some time off your drive. Fly StndAIR, Fly The Whale, or New York Helicopter for a quick trip east, completely traffic free. Beware: Air travel comes at a price, especially if you choose to fly private. Look out for Packing for the Hamptons and Eating in the Hamptons posts tomorrow and Friday.